Pasco teachers and staff say #RespectUsNow | Fight Back! 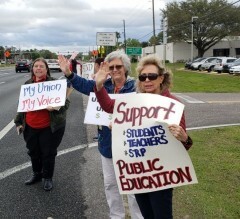 Tampa, FL - Over 30 teachers, staff, parents and community members rallied outside the Pasco County School District Office, March 5, to build support for United School Employees of Pasco (USEP) and challenge dismal salaries for school district employees, along with the lack of funding for public education. The rally occurred only minutes before a Pasco County school board meeting inside. Teachers and school employees in Pasco are underpaid. In contract negotiations with the school district last year they won across-the-board 2% salary increases. However, this will do little to alleviate the financial pressure on workers, many of whom have been forced to take second jobs in order to survive. 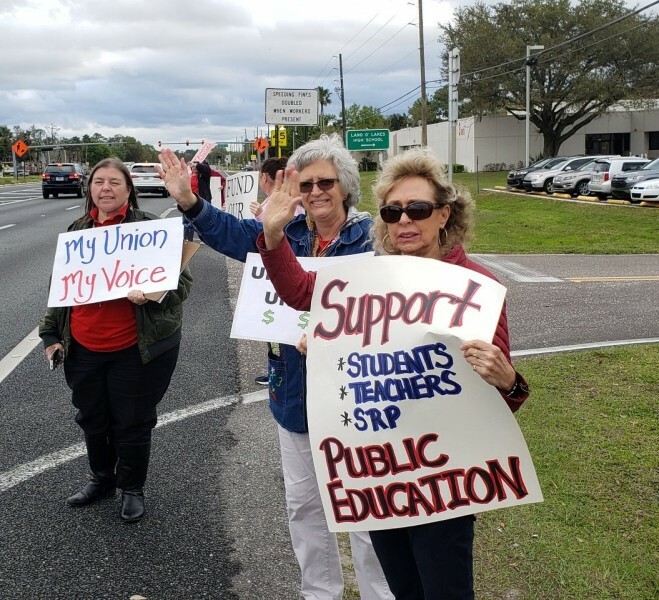 It would take a Pasco County school teacher 16 years’ worth of raises to make what teachers start with in neighboring Pinellas County. Staff members in Pasco county start at $9.25 an hour, not even a dollar over Florida minimum wage. As a result, teachers are raising hell to bring attention to their situation. In addition to these issues, USEP is highlighting the gross lack of funding for their programs in general. In January USEP brought negotiations to a halt due to the county’s unwillingness to respect their demands. The county is insistent upon enforcing state mandated teacher evaluations and training requirements, as well as ignoring seniority altogether as it applies to layoffs and transfers. Teacher evaluations are largely based on student test scores, which have a bias towards wealthier communities, and against more rural and poor areas like Pasco county. Negotiations between USEP and the Pasco school district are heading to mediation this month.